Radiohead are getting ready for a very big Big Apple kind of week, with a couple of special TV appearances and a just-announced pair of intimate (for them, anyway) shows. It all starts this Saturday, 24 September, when the band is the featured musical guest on the season premiere of Saturday Night Live. No word yet as to what songs they'll play, but it has been revealed that the group will perform four selections from its latest album, The King Of Limbs, when they appear two days later, 26 September, on a special Radiohead-themed edition of the highly rated The Colbert Report. Make that five songs: The band will also play one extra number that will be an exclusive on The Colbert Report's website. Explained host Stephen Colbert in a statement: "I look forward to meeting the Radioheads and leveraging their anti-corporate indie cred to raise brand awareness for my sponsors." 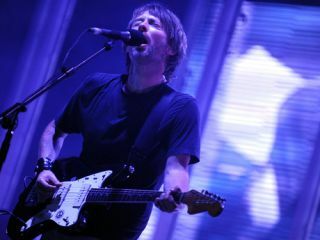 And if that weren't enough, Radiohead will play two shows at New York City's Roseland Ballroom on 28 and 29 September. Tickets go on sale 26 September at 10am EST and there is a 2 ticket limit per household. Should you live in New York City, the surrounding areas, or if you're cool with jetting to the gig, you can order tickets (if you're very lucky) at Ticketmaster. For those 'Radioheads' and their many, many fans, it should be a week to remember.